As technology ever improves, new tools and devices to improve our lives and keep us safe are constantly evolving. One of those devices are AFCI protection! Put simply, they are outlets and/or circuit breakers that hold specialized and micro-miniaturized electrical circuits that can catch the tell-tale signs of electrical current problems. Once the problem is detected, they automatically shut down the electricity, keeping your home and your family safe! The difference between AFCI protection and a regular circuit breaker is an important one; regular circuit breakers are designed to protect a building’s electrical system, not people. The amount of electricity required to kill a person is thousands of times less than the amount of electricity it takes to trip a regular circuit breaker, which is why AFCI protection is a crucial part of your home. Fuses and circuit breakers-also called over current devices-are used in your home’s electrical system to protect against too much electrical current running through the wiring. Some power is lost as the electrical current flows through the wires, because the wires contain some electrical resistance. This is perfectly fine, but if too much current flows through at once, the wire can get too hot and spark a fire. To prevent against this, fuses or circuit breakers can detect when too much electricity is flowing; a fuse will blow, and a circuit breaker will trip. When this does happen, it most often means that someone has attempted to plug too many devices into one circuit. However, as we talked about earlier, fuses and circuit breakers are not designed to protect people from electrocution; they are designed to protect the wiring from fire. This is why AFCI protection is important. AFCI protection is similar to GFCI outlets, but they protect against another potential danger. Sometimes certain electric appliances will be used to convert electricity into heat, and sometimes these devices also create heating in the area that the device plugs into the wall. This is called arcing. You can sometimes find it when you unplug a heating appliance quickly, such as a clothes iron. Electrical arcs can also be caused when a nail is driven through a wire in a wall-like when someone is hanging a picture frame-or by rodents chewing through electrical wiring. AFCI protection will catch this arcing and shut down the outlet before any damage can be done. The National Electrical Code requires AFCI protection for electrical wiring in all sleeping areas, such as bedrooms or dens with fold out couches, because these are areas that a fire could catch someone sleeping who is unable to quickly get out of the area. AFCI protection is not found directly in the wall receptacle itself, but are simply added into your home’s main electrical service equipment panel in the form of special circuit breakers. While older homes won’t usually be required by building codes to possess AFCI protection, they will be required to be mentioned by a professional home inspector’s higher safety standards. Protecting your home with AFCI protection is easy; simply have a licensed and insured electrician replace the circuit breakers for bedroom areas with AFCI circuit breakers. 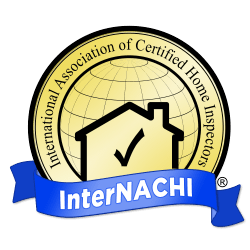 Any InterNACHI home inspector will tell you how important these devices will be in your keeping your family and home safe!